During the Spring Festival holiday, to travel and pray for blessings, luck and good fortune for the coming year is considered a wise choice by many. Chinese Lunar New Year, also known as Spring Festival, falls on Feb. 5 this year and is the most important holiday for the Chinese people. During the festival holiday, praying for good fortune is considered a wise choice by many. Here are ten recommended temples for praying for New Year luck across the country. Home to the Bodhisattva of Wisdom, or Wenshu in Chinese, Wutai Mountain in Shanxi province is one of China’s Four Holy Buddhist Mountains. 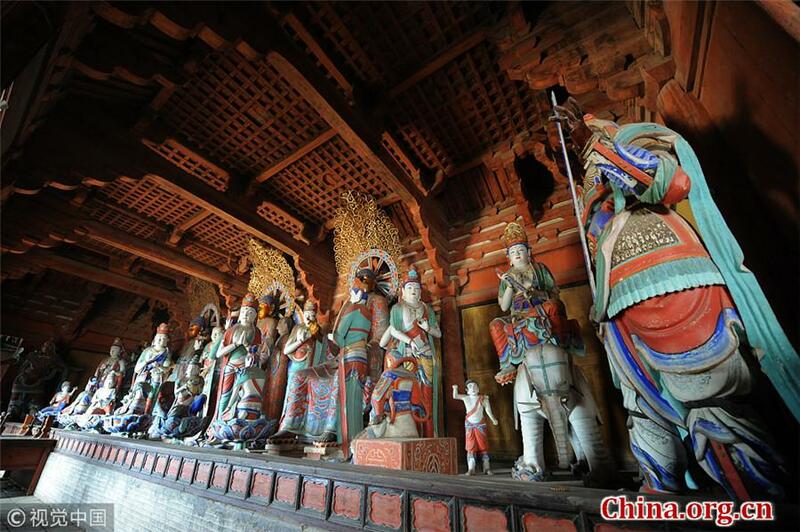 Foguang Temple on Wutai Mountain is a historical, cultural relic under national protection. The temple was established in the reign of Emperor Xiaowen (471 - 499) in the Northern Wei dynasty. The major hall of the temple is the Great East Hall, built in year 857 of the Tang Dynasty. There are 35 colorful Tang Dynasty sculptures inside the hall, in addition to wall murals that depict various Buddhist stories.